Superglass Multi-Roll 44 is lightweight, non-combustible glass mineral wool insulation roll. The flexible roll is perforated to allow easy installation between common joist spacings and minimum onsite cutting and waste. 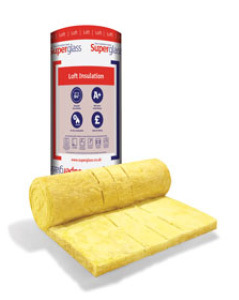 Superglass Multi-Roll 44 is primarily used as thermal insulation in new and existing lofts/cold roofs. However, it can be used in a number of other applications including suspended timber ground floors. When used in the loft/cold roof it can be installed between and over the joists. – Provides excellent thermal performance with a thermal conductivity of 0.044W/mK.